Our selection of recent arrivals, interesting and quirky pieces all offering good value and decorative appeal. This selection is updated regularly every few weeks. We have 13 pages of our special selections this month. For a larger photograph, click on more details below. Made by Woods for the retailers Hales Hancock and Godwin. A lovely shape jug with ochre rim. Backstamp: Aquila HH & G Ltd Reg No 718718. There is a little wear and a few minor manufacturing faults to the foot with a little discolouration underneath and to the handle. As usual sounds much worse than it looks! 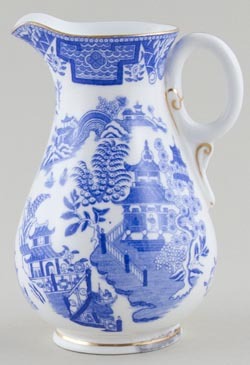 Lovely flow blue jug. Backstamp: Watteau Doulton Burslem England. A small firing fault under the top curve of the handle and underneath a little minor wear, otherwise excellent condition. 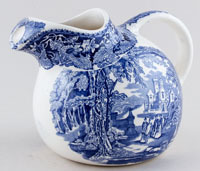 Fabulous little jug printed in a steely blue. Backstamp: Booths Silicon China England Davenport Willow. There is a tiny tiny nick to the foot and inside some excess clay otherwise excellent condition. Bone china with gilt. 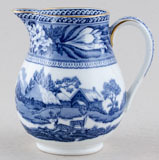 A delightful little jug with pretty handle. Backstamp: Royal Worcester England with date code for 1895 and in script B389. Fine all over crazing otherwise excellent condition. A most unusual and attractive piece. Backstamp: Masons Patent Ironstone China Vista England Guaranteed Permanent & Acid Resisting Colours. Crazed with just a hint of discolouration and a small hairline to the rim. 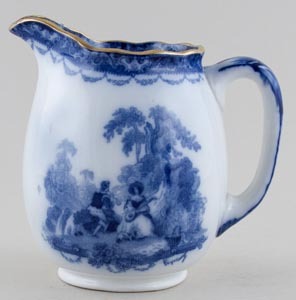 With ochre rim and gilt highlights to the pattern, an absolutely gorgeous jug. Backstamp: Spode Stone China and in script 2061. Inside there is a small manufacturing fault and there is a little minor wear to the rim, otherwise excellent condition. 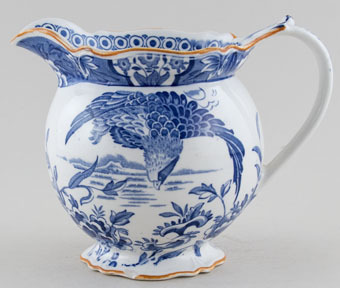 Gorgeous little jug with moulded body, ornate handle and lovely pattern detail inside the spout. Backstamp: Royal Doulton England. A tiny tiny blemish inside and underneath a little minor wear and discolouration, overall excellent condition. Bone china with gilt and printed in a light soft steely blue. Backstamp: Wedgwood England. A little mottling underneath otherwise excellent condition. Photographs are not all to the same scale.